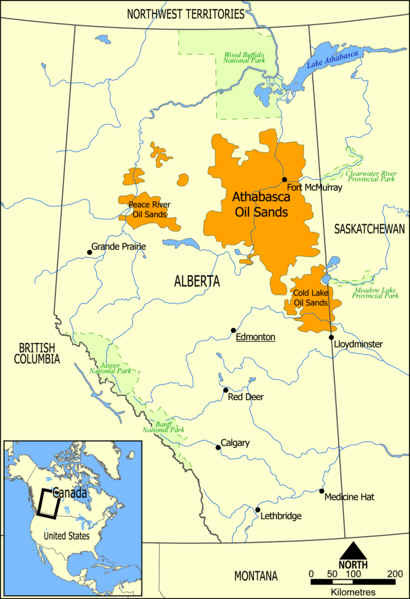 Tar sands(also referred to as oil sands) are a combination of clay, sand, water, and bitumen, a heavy black viscous oil. Tar sands can be mined and processed to extract the oil-rich bitumen, which is then refined into oil. The bitumen in tar sands cannot be pumped from the ground in its natural state; instead tar sand deposits are mined, usually using strip mining or open pit techniques, or the oil is extracted by underground heating with additional upgrading. 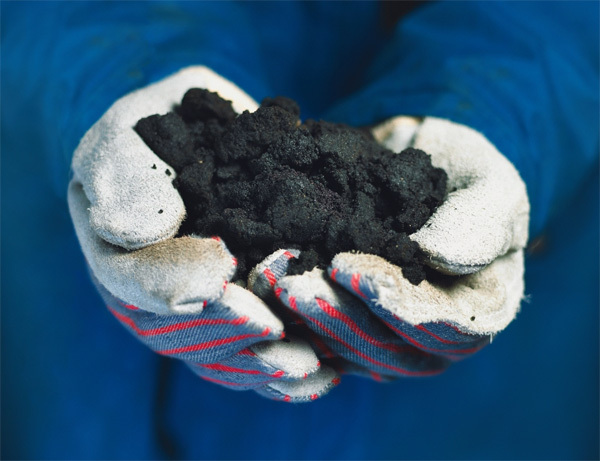 Tar sands are mined and processed to generate oil similar to oil pumped from conventional oil wells, but extracting oil from tar sands is more complex than conventional oil recovery. Oil sands recovery processes include extraction and separation systems to separate the bitumen from the clay, sand, and water that make up the tar sands. Bitumen also requires additional upgrading before it can be refined. Because it is so viscous (thick), it also requires dilution with lighter hydrocarbons to make it transportable by pipelines. Much of the world's oil (more than 2 trillion barrels) is in the form of tar sands, although it is not all recoverable. While tar sands are found in many places worldwide, the largest deposits in the world are found in Canada (Alberta) and Venezuela, and much of the rest is found in various countries in the Middle East. In the United States, tar sands resources are primarily concentrated in Eastern Utah, mostly on public lands. The in-place tar sands oil resources in Utah are estimated at 12 to 19 billion barrels. Currently, oil is not produced from tar sands on a significant commercial level in the United States; in fact, only Canada has a large-scale commercial tar sands industry, though a small amount of oil from tar sands is produced commercially in Venezuela. The Canadian tar sands industry is centered in Alberta, and more than one million barrels of synthetic oil are produced from these resources per day. Currently, tar sands represent about 40% of Canada's oil production, and output is expanding rapidly. Approximately 20% of U.S. crude oil and products come from Canada, and a substantial portion of this amount comes from tar sands. The tar sands are extracted both by mining and in situ recovery methods (see below). Canadian tar sands are different than U.S. tar sands in that Canadian tar sands are water wetted, while U.S tar sands are hydrocarbon wetted. As a result of this difference, extraction techniques for the tar sands in Utah will be different than for those in Alberta. Tar sands deposits near the surface can be recovered by open pit mining techniques. New methods introduced in the 1990s considerably improved the efficiency of tar sands mining, thus reducing the cost. These systems use large hydraulic and electrically powered shovels to dig up tar sands and load them into enormous trucks that can carry up to 320 tons of tar sands per load. After mining, the tar sands are transported to an extraction plant, where a hot water process separates the bitumen from sand, water, and minerals. The separation takes place in separation cells. Hot water is added to the sand, and the resulting slurry is piped to the extraction plant where it is agitated. The combination of hot water and agitation releases bitumen from the oil sand, and causes tiny air bubbles to attach to the bitumen droplets, that float to the top of the separation vessel, where the bitumen can be skimmed off. 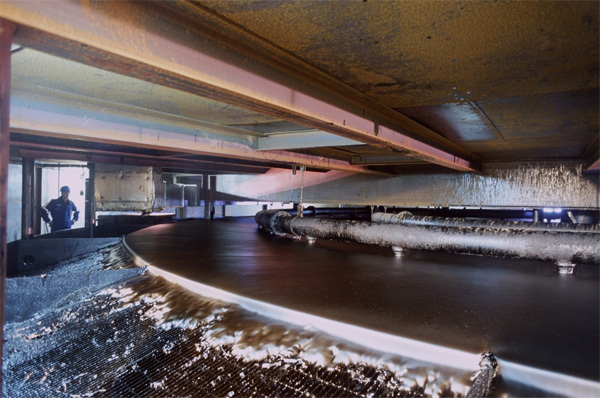 Further processing removes residual water and solids. The bitumen is then transported and eventually upgraded into synthetic crude oil. About two tons of tar sands are required to produce one barrel of oil. Roughly 75% of the bitumen can be recovered from sand. After oil extraction, the spent sand and other materials are then returned to the mine, which is eventually reclaimed. In-situ production methods are used on bitumen deposits buried too deep for mining to be economically recovered. These techniques include steam injection, solvent injection, and firefloods, in which oxygen is injected and part of the resource burned to provide heat. So far steam injection has been the favoured method. Some of these extraction methods require large amounts of both water and energy (for heating and pumping). 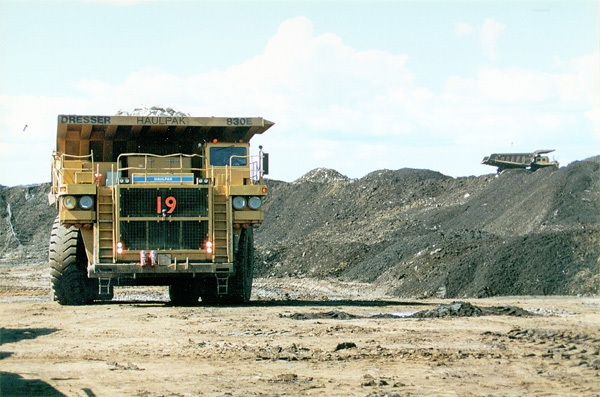 Both mining and processing of tar sands involve a variety of environmental impacts, such as global warming and greenhouse gas emissions, disturbance of mined land; impacts on wildlife and air and water quality. The development of a commercial tar sands industry in the U.S. would also have significant social and economic impacts on local communities. Of special concern in the relatively arid western United States is the large amount of water required for tar sands processing; currently, tar sands extraction and processing require several barrels of water for each barrel of oil produced, though some of the water can be recycled. Second only to the Saudi Arabia reserves, Alberta's oil sands deposits were described by Time Magazine as "Canada's greatest buried energy treasure," and "could satisfy the world's demand for petroleum for the next century". Oil Sands are deposits of bitumen, a molasses-like viscous oil that will not flow unless heated or diluted with lighter hydrocarbons. They are contained in three major areas beneath 140,200* square kilometres of north-eastern Alberta - an area larger than the state of Florida, an area twice the size of New Brunswick, more than four and half times the size of Vancouver Island, and 26 times larger than Prince Edward Island. However, only about two per cent of the initial established resource has been produced to date. Alberta Energy encourages the responsible development of these extensive deposits through planning and liaison with government, industry and communities to ensure a competitive royalty regime that is attractive to investors, appropriate regulations and environmental protection and the management of Crown rights to oil sands while taking into account some of the barriers - higher technological risk and higher capital costs - faced by oil sands developers. Alberta's oil sands industry is the result of multi-billion-dollar investments in infrastructure and technology required to develop the non-conventional resource. According to the Canadian Association of Petroleum Producers (CAPP), in 2006 industry investment in Alberta’s oil sands totalled approximately $14 billion. In 2006 Alberta's oil sands were the source of about 62 per cent of the province's total crude oil and equivalent production and about 47 per cent of all crude oil and equivalent produced in Canada. Over the last four fiscal years, from 2003/2004 to 2006/2007, oil sands development returned $4.276 billion to Albertans in the form of royalties paid to the provincial government. Annual oil sands production is growing steadily as the industry matures. Output of marketable oil sands production increased to 1.126 million barrels per day (bbl/d) in 2006. With anticipated growth, this level of production could reach 3 million barrels per day by 2020 and possibly even 5 million barrels per day by 2030. This degree of activity would support the development of other key industries and see Alberta become a Global Energy Leader. Development of Alberta's oil sands resources represents a triumph of technological innovation. Over the years, government and industry have worked together to find innovative and economic ways to extract and process the oil sands and energy research is more important today than ever before. Working through the Alberta Energy Research Institute, the Alberta government is committed to a collaborative approach to spur new technology and innovation programs that will reduce the impact of greenhouse gases and other emissions, and reduce the consumption of water and gas. There are 173 billion barrels of oil in the oil sands proven to be recoverable with today’s technology. Oil sands are contained in three major areas of northeastern Alberta beneath about 140,000 square kilometres, with approximately 500 square kilometres of land disturbed by oil sands surface mining activity. That's roughly the size of Florida, with the amount of land disturbed for oil sands mining roughly equivalent to the size of the Kennedy Space Centre. Approximately 80 per cent of recoverable oil sands is through in-situ production, with less than 20 per cent recoverable by mining. There are 91 active oil sands projects in Alberta. Of these, five are mining projects; the remaining projects use various in-situ (in place) recovery methods. In 2007, Alberta exported about 1.34 million barrels per day of crude oil to the U.S., supplying 13 per cent of their crude oil import. Every dollar invested in the oil sands creates about $9 worth of economic activity; with one-third of that economic value generated outside Alberta - in Canada, the U.S. and around the world. One in 13 jobs in Alberta is directly related to energy. Oil sands make up about five per cent of Canada’s overall greenhouse gas emissions and less than one-tenth of one per cent of the world’s emissions. 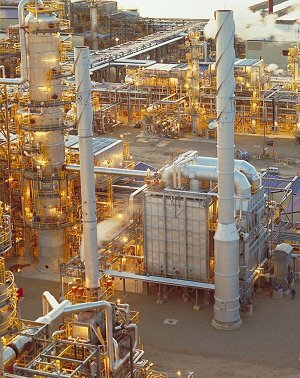 A $2 billion investment to advance steel-in-the-ground carbon capture and storage (CCS) projects is expected to reduce emissions by five million tonnes in annual reductions by 2015. That's the equivalent of taking one million vehicles, or one third of all registered vehicles, off of Alberta roads. The Government of Alberta and private industry have each invested more than $1 billion in oil sands research. Combined efforts will continue to bring science solutions that reduce the environmental footprint of oil sands development and increase economic recoveries.